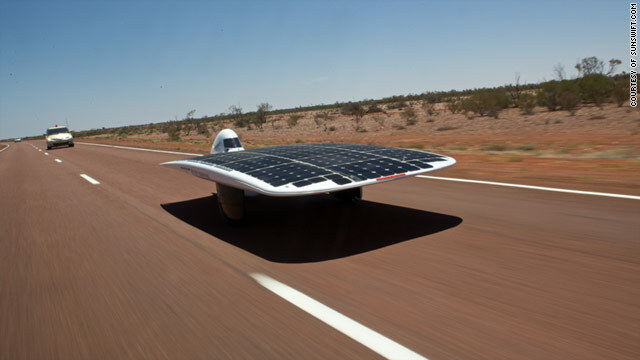 The record-breaking Sunswift IVy is officially the fastest solar powered vehicle in the world after clocking 88.8kph. (CNN) -- A solar-powered car which produces the same amount of energy as a household toaster has smashed the world speed record for a solar vehicle. The Sunswift IVy car clocked an average speed of 88.8 kph (55.2 mph) at a navy base in New South Wales, Australia. The car, which has an array of 400 silicon cells, was designed and built by a team of students from the Faculty of Engineering at Sydney's University of New South Wales. In completing the challenge, the team estimate that the car used around 1050 watts -- the same amount of energy you'd need to lightly toast a slice or two of bread. The new speed beats the previous record (78.3 kph) for cars powered by silicon solar cells set by the General Motors Sunraycer in 1988. For the world record attempt, the students enlisted the help of professional racing drivers Barton Mawer of Mawer Engineering and Craig Davis of Tesla Europe. For a valid record to be set the car was required to complete two 500-meter runs within one hour of each other. The Sunswift IVy is roughly the same size as an average family car, but is one-tenth of the weight thanks to its carbon fiber frame. It has a top speed of 115 kph (71.5 mph) and cost $280,000 AUD to develop. In 2009, the car won the World Solar Challenge -- a 3,000-kilometer race across Australia from Darwin to Adelaide -- which is considered one of the most prestigious competitions of its kind and regularly attracts entries from some of the world's top universities.